I’m not sure if this recipe exists in one of the many James Beard cookbooks. If I did, I would definitely list the source here. I actually came across this delightfully simple casserole/dip in the Paula Peck stack of unpublished recipes. Since I will usually make any crab recipe I happen to come across, Jim Beard’s Deviled Crab was an obvious must try. At first glance, I wasn’t really sure what this recipe was. Is it a casserole? A dip? A side dish? I’m still not quite sure. So I’ve decided it can be any one of those things and more, because it’s just that good. One simple description says it all – deconstructed crab cake. Think your favorite part about a crab cake but amplified. Easier to make and the emphasis is on the crab, the real star of the show (and not the often overused mushy breadcrumbs). Wherever it came from, I’m glad I discovered it and I think you will be too. Pick over crab meat and remove any cartilage. Roll or crush crackers and measure correct amount. Preheat oven 350 degrees and butter a 1 1/2 quart casserole or 6-8 individual crab or seashells. 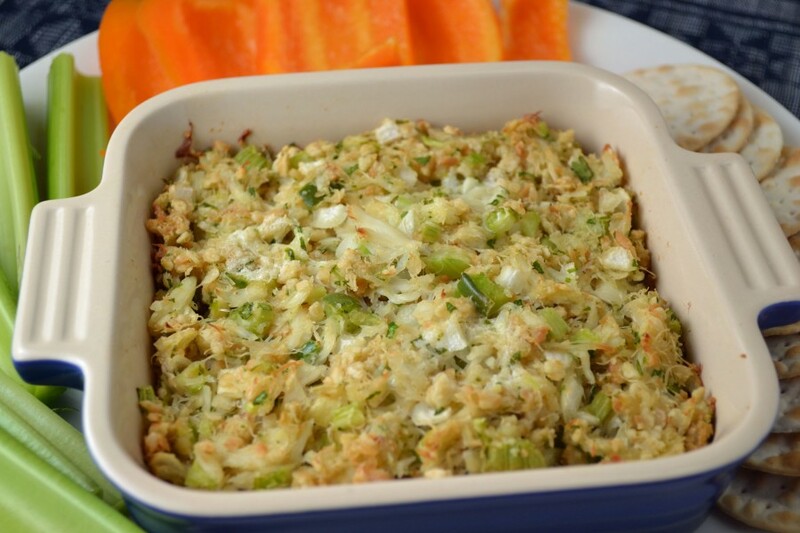 Mix crab meat, crumbs, chopped vegetables, all seasonings, melted butter, and heavy cream together thoroughly. Spoon into casserole or shells and dot the top with a little additional butter. Bake 30-40 minutes or bake individual shells 20 minutes. Serve hot with crudités or crackers. Hi Megan- this recipe sounds wonderful. I have quite a few James Beard cookbooks and the recipe for deviled crab in his Fireside Cookbook (I have the first edition from 1949) comes close to this one. He must have liked deviled crab, as he has a couple others in other books. I also found a deviled tuna. Thanks for the feedback Debbie. I have a couple of his books but didn’t see it in them. I’ll have to check out the others, as well as the deviled Tuna recipe. Thanks again. Best recipe I’ve found yet! Will make it this week. Need clarification tho… Where does the EVOO come in? Mix in with butter and cream? Drizzle on top? … Tx! Hi Paula – thanks for the catch! With some of these old unpublished recipes, I’ve found that a few ingredients are occasionally left out of the directions. The EVOO is mixed with the butter and cream – but drizzling on top sounds great too!